Modularized software design: separate objects to represent each part of a complete Digital TV implementation. The Electronic Program Guide Manager is the only optional object, but it is highly recommended to implement all three objects to get a full, feature-rich Digital TV implementation. In addition to these three new objects, a number of extension interfaces have been added to the OpenMAX AL player and recorder objects. The Digital TV Extension requires conforming to the Media Player profile of the OpenMAX AL specification. 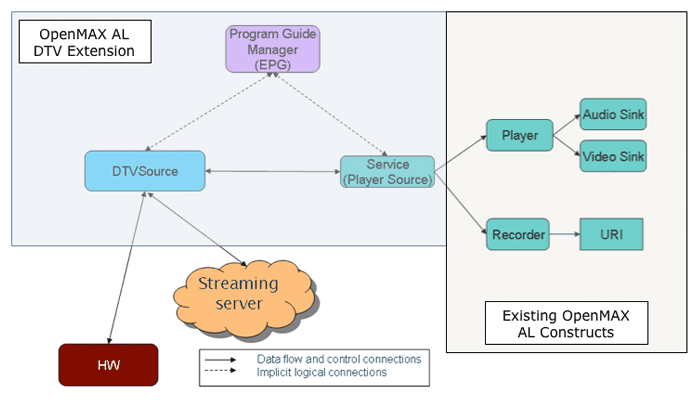 If Digital TV recording capabilities are to be implemented, then the Media Player/Recorder profile is mandated on the corresponding OpenMAX AL implementation. The figure below gives the overview of the objects in the DTV Extension and how they interact with existing OpenMAX AL constructs. The OpenMAX AL DTV Extension (provisional) specification is immediately available for download and may be used royalty-free by implementers and developers. The DTV Extension specification has been released in provisional form to allow developers and potential adopters to get an early look at it and provide feedback. A discussion forum has been set up to facilitate developer feedback.